Inkjet Printers, Color Profile Large Format Printer, RIP Software, PDF Converter & PostScript - iProof Systems Inc.
PowerRIP ScreenPrint™ is a PostScript Level 3 Compatible RIP (Raster Image Processor) designed to produce high quality film positive or negatives with halftone dots using Epson inkjet printers. It provides more control over the ink than a native Epson driver, and allows users to specify which ink channels are used when printing black ink. One ink channel or any number of ink channels,1, 2, 3, 4, 5, 6, 7, 8, up to ALL of the ink channels can be used. Better than ALL black ink systems, users can reduce ink costs by only using half of the channels for black ink and filling other channels with clear cleaning solution. No other RIP is a simple to use and control ink density with. Preview before you Print It capabilities are included that allow users to magnify and examine the actual picture being sent to the printer before printing. This can save film costs and time by preventing unexpected errors. Nesting output from multiple files also saves film. A free 2 week demo is available, you can rent to own, or purchase. Desktop version Stylus Photo 1270, 1280, 1290, 1390, 1400, 1410, 1430, 1500W, L1800, R1800, R1900, R2000, 2100, 2200, R2400, R2880, R3000 Stylus Color 1520, 3000, Stylus Pro 3800, 3880, 4000, 4800, 4880, 4900 Sure Color P400, P600, P800 Large Format version adds these printers Stylus Pro 7600, 7700, 7800, 7880, 7890, 7900, 9600, 9700, 9800, 9880, 9890, 9900, 11880, Sure Color T3000 series, T3200 series, T5000 series, T5200 series, T7000 series, and T7200 series. PowerRIP ScreenPrint is a PC program compatible with Windows 10, 8, 7, Vista, and XP.32/64 bit versions. PowerRIP DTG was developed for Direct To Garment printers using these Epson printers : The 8 color Epson Stylus Photo R3000 or Epson Sure Color P600. Also 6 color Epson printers using the Epson Artisan 1430, Stylus Photo 1500W, Stylus Photo 1400/1410/1390 and the bulk ink L1800. A Special Version designed for the Epson SureColor F2000/SCF2100. This new version of our popular DTG RIP PRO v06 customized for the Epson SCF2000/SCF2100, offers options that are not available with Epson's Garment Creator software or any other RIP software. There are three basic levels of color saturation for color profiles, plus three basic white generation styles. Unique white generation boosts the brightness of deep blues and reds beyond other RIPs and Garment Creator. The industry's best highlight white generation, with the most control over making the whites look like screen printing. We offer 4 ways to print white ink only shirts and even a black ink only setting for budget jobs. We can control the white under the darkest colors to improve wash ability. We studied all other RIP offerings and created a new approach, better and more versatile than what has been offered before. The price point of this RIP, makes it a perfect supplement to the Epson Garment Creator for all Epson SCF2000/SCF2100 users. 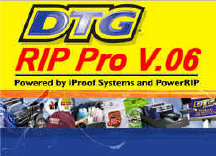 DTG RIP PRO v6 for Epson SCF2000/SCF2100 is a PC program compatible with Windows 10, 8, 7, Vista, and XP 32/64 bit versions. A major update for all users of the DTG brand printers and other direct to garment printers. Includes an advanced One-Pass white that prints saturated brilliant deep colors and also offers, as an free option, an improved ink configuration for even better One-Pass printing. Other improvements have been made to all ICC profiles and Highlight white. Highlight white option allows 720x720 color to be printed on 1440x720 white with speeds surpassing even One-Pass at 1440x1440. The choke feature and all white creation have been improved. Version 6 now available for the PC supporting Windows 10, 8, 7, Vista, and XP on 32 and 64 bit systems. PowerRIP X™ is a PostScript Level 3 Compatible RIP (Raster Image Processor) for Epson, Canon and HP Inkjet printers. PowerRIP was the first PostScript RIP product in the world for Macs to drive inkjet printers. PowerRIP X enabled printers like the Stylus Photo 1400, Stylus Photo R3000 or the Pro 4900 to produce contract quality proofs with Apple’s OS X 10.9, 10.8, 10.7, 10.6, 10.5, 10.4 and popular graphic applications. Development stopped on PowerRIP X with Apple's release of 10.10. We now offer a competitive replacement product from ColorByte software to our users using Apple's latest operating systems. We have negotiated a 20% reduction from the list prices of ColorByte for our users, when they purchase the software upgrade through us. We studied all products in the Mac color printing inkjet market and found the ColorByte's new R.E.D. software to be the best match for our user base in performance and price. PowerRIP X supported over 100 printers, the R.E.D., replacement software product, will support the same number of printers as PowerRIP X and will add hundreds of new printers as well. There are two pricing levels based on the output size of the printer being driven. Suggested retail $399 purchased through iProof the price is only $319. Suggested retail $599 purchased through iProof the price is only $479. Contact Sales@iproofsystems.com to purchase or access demo software. RIPs for more than one solution from a single image to running the press .